Clean restrooms make a statement in every business. The latest technology for handling paper towel waste is ecotrash PTC® for paper towel compaction. With PTC, your employees are free from constantly monitoring trash cans in high-traffic restrooms. 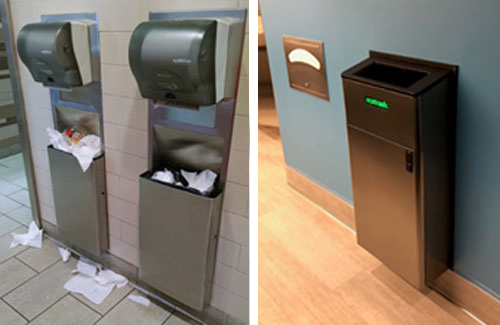 Automating restroom trash containers with ecotrash PTC makes high-volume restrooms appear neat and clean. No more paper towels on the floor. ecotrash PTC holds 20 times more paper towels than traditional in-wall trash cans. 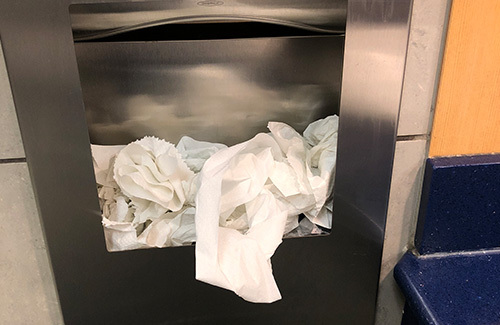 Recycle paper towels instead of throwing them away by using ZeroWaste® Bins inside ecotrash PTC. These single-use trash bins made from recycled fiber can redirect paper towel waste for recycling or composting. A 40’ semi trailer with loose paper towels weighs around 2,000 lbs. Using ZeroWaste bins filled with compacted paper towels and efficiently stacked on a pallet, a 40’ semi trailer could hold 22,000 lbs of used paper towels. Imagine the fuel savings hauling 11X the trash in one load.